Ta Chen International, a Long Beach, California-based metal distribution company, moved to Pleasant Prairie in 2014. Wisconsin Economic Development Corp. awarded Ta Chen up to $1 million in tax credits in 2013. The company has created 67 of the promised 72 jobs. Photo by Tara Golshan of the Wisconsin Center for Investigative Journalism. County Materials Corp.: The Marathon County-based concrete construction and landscaping manufacturer was awarded up to $750,000 in tax credits to invest $14 million in expansion and create 43 new positions at its Rock County location. The company said it has exceeded those requirements, investing more than $17 million and creating 65 new jobs. County Materials’ top officials gave Gov. Scott Walker $51,000, according to the campaign finance watchdog Wisconsin Democracy Campaign. 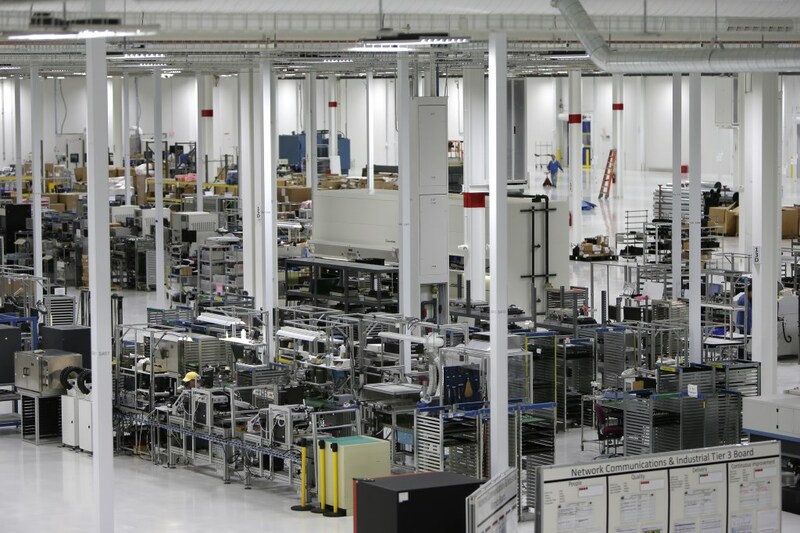 Ruud Lighting: The Racine company got $725,000 to help expand its LED lighting manufacturing plant and has qualified for nearly $1.8 million of its $3.3 million in job tax credits by creating 340 of its 469 promised new jobs. Paul Jadin, the former head of WEDC, said the award kept the company from moving to North Carolina. “We not only retained them, we moved a lot of the North Carolina jobs up to Wisconsin,” he said. In 2012, Wisconsin Economic Development Corporation awarded Blue7 Solutions, an information technology company based in Glendale, $3.25 million in tax credits and a $500,000 grant to create 250 jobs with then-partner Trisept Solutions. 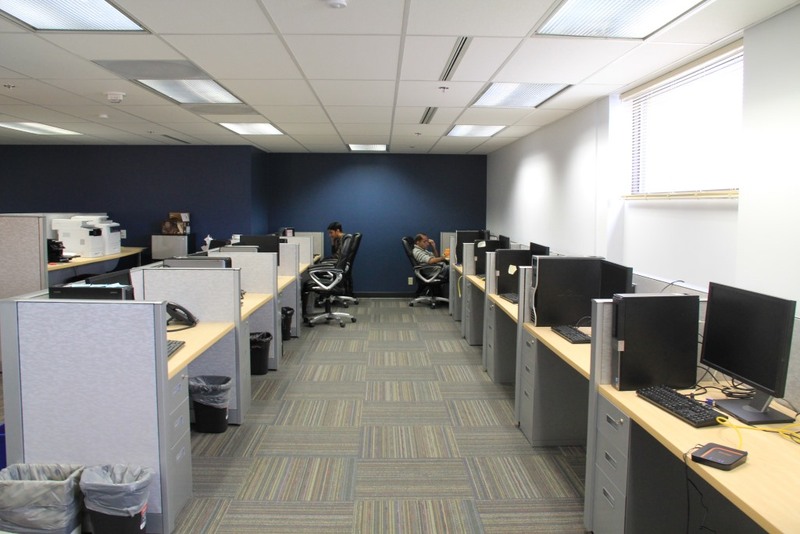 Blue7 Solutions separated from Trisept Solutions in 2014 and has since moved offices to house its six employees. It has not yet qualified for any tax credits or the grant. Photo by Tara Golshan of the Wisconsin Center for Investigative Journalism. Kestrel Aircraft: The airplane manufacturer promises to bring more than 600 jobs to the struggling northern Wisconsin economy. The company initially got a $2 million loan and up to $18 million in tax credits from the state without full financial review, later securing another $2 million loan. But the Superior firm has created just 24 jobs, according to WEDC, or about 35 jobs, according to Kestrel CEO Alan Klapmeier. He blamed delays and alleged false promises by WEDC and the Wisconsin Housing and Economic Development Authority, which said it offered Kestrel $30 million in investor tax credits. Klapmeier insisted it was $90 million — or $30 million a year over three years. The company has earned $717,500 in tax credits for $1.1 million in capital investments and spending $360,000 on worker training. Then-WEDC spokesman Mark Maley told Wisconsin Public Radio this summer that the state has extended repayment of the loans to help the company succeed. Superior Mayor Bruce Hagen noted Klapmeier already has founded one successful aviation company. Klapmeier said he is confident Kestrel, now part of ONE Aviation Corp., will bring the six-passenger airplane to market. Gov. 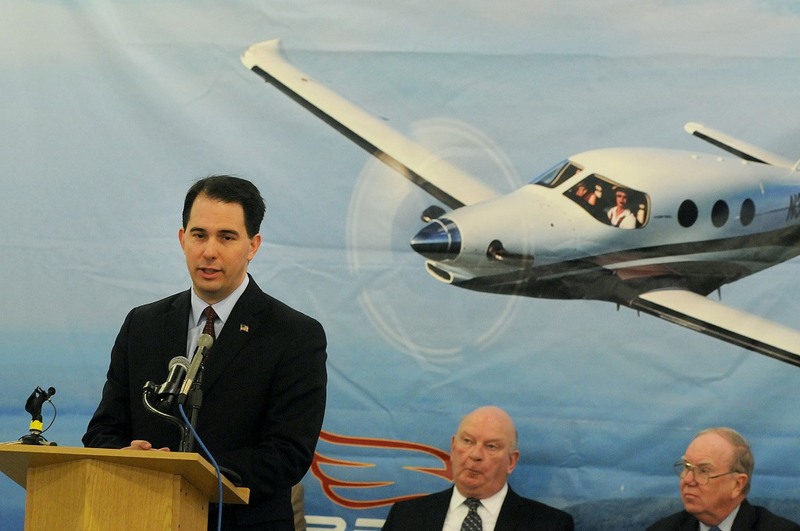 Scott Walker announces up to $20 million in state subsidies in 2012 for Kestrel Aircraft, which has promised to bring more than 600 jobs to Superior. Three and a half years later, the company, which received state assistance without a full financial review, has created just a few dozen jobs. Kestrel had also promised to bring hundreds of jobs to Brunswick, Maine, before moving its headquarters to Wisconsin in 2012. Photo by Jed Carlson of the Superior Telegram. Plexus Corp.: A Neenah manufacturer, Plexus sent 116 jobs out of the country months after it was awarded up to $15 million in state subsidies to create jobs and make capital investments in 2012, WKOW-TV reported last year. Democrats are sponsoring bills in the Senate and Assembly to ban companies from getting state taxpayer assistance for five years if they outsourced jobs after receiving state aid. According to WEDC, the company reported Aug. 18 that it had added 300 of the promised 350 employees since 2012 and is planning to add an additional 100-plus jobs. The Plexus contract requires it to retain 1,000 jobs, but Plexus already had at least 1,792 employees, according to the WEDC database. Without naming the company, the Legislative Audit Bureau highlighted the Plexus deal as one that violated state law. Auditors found the company qualified for $517,000 in job-creation tax credits even though its workforce shrank by 307 employees. WEDC says the company now reports having 2,327 employees. And Plexus is ahead of projections on capital expenditures, claiming $270 million spent, compared to a projected $68 million, the agency said. Plexus Corp.’s $50 million manufacturing plant in Neenah is the largest single building ever constructed in the Winnebago County community. Plexus was awarded up to $15 million in tax credits in 2012 by the Wisconsin Economic Development Corp. without prior financial review. WEDC says as of Aug. 18, the company had created 300 of the promised 350 jobs. But WEDC was cited in a state audit released in May for previously giving Plexus job credits even though it had cut its workforce by 307 people. Photo by Wm. Glasheen of Post-Crescent Media. Building Committee Inc.: Owned by Bill Minahan, a major donor to Walker, Building Committee Inc. has gone belly up, leaving taxpayers on the hook for a $500,000 unsecured loan that was supposed to create 155 jobs. The Milwaukee company lied when it said it had not been sued on its loan application, the Wisconsin State Journal reported. And the Milwaukee Journal Sentinel found WEDC officials kept hunting for government funding for BCI even after a Minahan creditor told them the construction company owner planned to use it to make overdue lease payments on luxury vehicles. Wisconsin Public Radio’s Danielle Kaeding contributed. The nonprofit Wisconsin Center for Investigative Journalism (www.WisconsinWatch.org) collaborates with Wisconsin Public Radio, Wisconsin Public Television, other news media and the UW-Madison School of Journalism and Mass Communication. All works created, published, posted or disseminated by the Center do not necessarily reflect the views or opinions of UW-Madison or any of its affiliates.